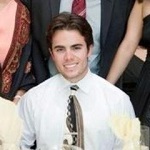 Gregory Ciotti is the marketing strategist at Help Scout, the invisible email management software for small-businesses and startups. Get more customer service content from Greg on the Help Scout blog or stop by and download one of our Customer Loyalty Resources (no charge). By now you know that the customer experience will play a pivotal role in the success of small-businesses (especially in competitive industries) in 2013 and beyond. What you may not know is that despite the hype surrounding social media, a recent study has shown that email is still the most widely used communication medium online, especially when it comes to contacting businesses for support. That being said, email has been and will continue to be a significant platform for your business when it comes to supporting customers and giving them an amazing customer experience. Outside of the typical “this isn’t working” email, there are 5 specific emails that you will receive that must be done right; otherwise you risk making your customers very unhappy. Below, we’ll cover these emails with actual examples (company names removed out of pity! 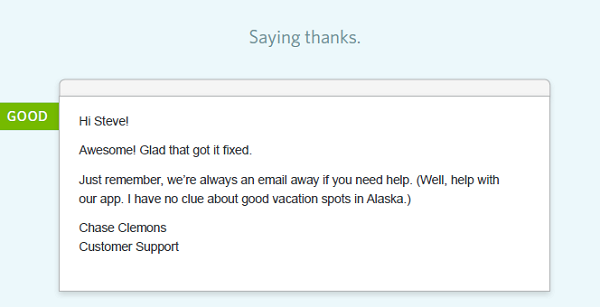 ), so you can see what improvements can be made to your support emails. Have you ever sent an email to someone and had that moment of pause where you had to double-check to see if it actually went through? 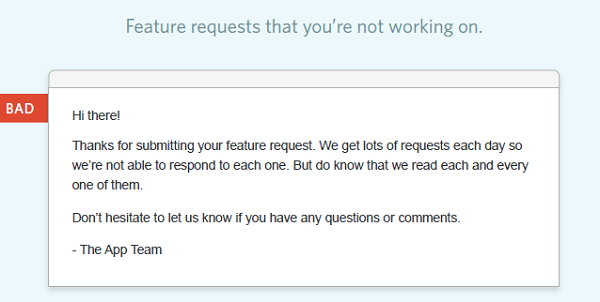 It’s quite annoying, especially when it is done via a company site (like a contact form). You’re sitting there feeling dumb, not knowing whether or not the long message you just typed will reach anyone. This is why those “first contact” emails are so important, in addition to making your website user-friendly by notifying customers that their email has been received. Apparently this team has never heard of the phrase “Thank you,” because it is not present anywhere in the email, despite the fact that a customer took their time to contact them. I didn’t know anyone but the Queen of England used terms like “correspondence”; drop the fluffy talk and make it feel like a conversation. Oh boy, the generic ticket number… nothing makes you feel loved like being assigned a 6-digit number. Avoid this if at all possible. Who’s the “App Team?” I understand that the support team probably consists of many people, but use the head support member’s name so it feels like “Steve” will be checking out my query, rather than some bot. First impressions really matter, so make sure you get them right the first time around! You know that customer feedback is hugely important to find out what your customers want from your product, but you also know that you cannot rely on feedback as a crutch. Some of your most innovative ideas will come from your team and not your customers. That means saying “No” to certain features. 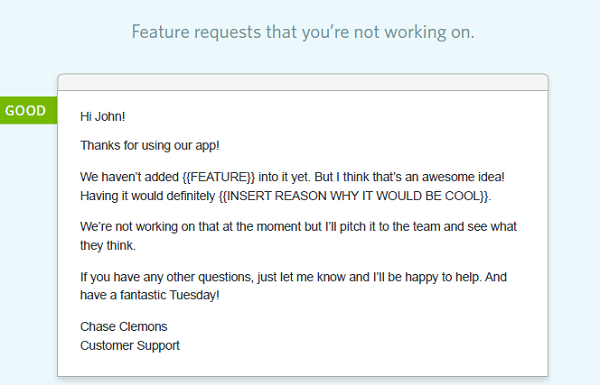 More importantly, for features that might be on the way, you need to be sure you are being honest and clear with customers about when they can actually expect them to be implemented (if ever). So, let’s say you run into a situation where a customer really wants a feature, but you know you are not going to implement it. While they technically were “submitting” their idea, that is a very impersonal word and there is no hint of a thanks in this email. Use terms like “sharing” and “thoughts” while reminding customers that you appreciate their feedback. You “read each and every one…” Yeah, customers have heard that before. and they don’t care. They’d rather know that you value their idea; they don’t need to know about the rest. That last sentence reads like a bot again; make it personal so people feel like they’ve contacted a living, breathing human! Customers are often highly attached to their ideas, so handling them with care is a critical customer service skill that you and your employees must master. This one should be easy, right?! Right, but since customers are coming to you on a high note (and now have a positive vested interest in your company) you want to make sure you handle these emails properly; no reason to upset an already happy customer! Really, the most important thing here is to come across as truly appreciative and “fun,” as this is one of those times that is actually pays to put plenty of personality in your emails. Ah, our old friend “Customer Service Unit #8735,” sounding like a robot again. Your customer is giving you props; treat them like someone who just gave you a sincere compliment! Have some fun here “App Team”; leave them with something memorable to show them that you appreciate the time they took to thank you. This is a very sensitive email, and by far one of the most important. I’ve shown you the data that says nearly 7/10 customers are willing to try a company again (after a bad experience) as long as their first complaint gets dealt with in a competent manner. This is your chance to win people back with your exceptional customer service and show them that although you made a mistake, you are ready, willing and able to make it right. This email honestly sounds passive-aggressive, and that is the last thing you want. You are “sorry for the inconveniences”? It’s almost like saying that you are sorry that they are having problems… which may be the case, but the customer doesn’t see it that way when they are upset! Don’t beat around the bush; apologize outright to customers and let them know you are ready to help. Get specific and enthusiastic… Find out what they don’t like about your product/service, then find out what they do like and how they are currently using it. Show them that you are unhappy that they are unhappy, and affirm their belief that someone on your team is just as upset about this situation as they are! At this stage, it is too risky to try to keep a customer, just make the process as easy as possible and when they are ready to come back in the future, they will. While customer retention is important, trying to retain customers who are on their way out will just leave them with more headaches, and they won’t appreciate it. 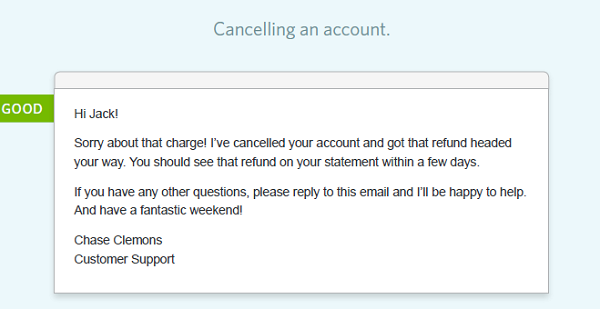 They are trying to cancel their account and you are asking them to jump through more hoops! That is a no-no, just do it for them and you can guarantee that you will leave on better terms. Leave nothing to doubt, make sure the customer knows that they will be refunded (if that’s applicable) and that they will not be charged for anything else. Now you can leave on a high note, even with customers who are on their way out. Leave a comment, and let me know what other tricky emails you often come across when dealing with customers. How do you handle them? If you want even more information on support emails, download our free guide on The Art of Writing Better Support Emails (totally free). Thank you for reading, and I will see you in the comments!